From the collection: Sailors’ Knots (1909). Illustrations by Will Owen. Fortunately for Captain Bligh, there were but few people about, and the only person who saw him trip Police-Sergeant Pilbeam was an elderly man with a wooden leg, who joined the indignant officer in the pursuit. The captain had youth on his side, and, diving into the narrow alley-ways that constitute the older portion of Wood-hatch, he moderated his pace and listened acutely. The sounds of pursuit died away in the distance, and he had already dropped into a walk when the hurried tap of the wooden leg sounded from one corner and a chorus of hurried voices from the other. It was clear that the number of hunters had increased. He paused a second, irresolute. The next, he pushed open a door that stood ajar in an old flint wall and peeped in. He saw a small, brick-paved yard, in which trim myrtles and flowering plants stood about in freshly ochred pots, and, opening the door a little wider, he slipped in and closed it behind him. Captain Bligh turned, and saw a girl standing in a hostile attitude in the doorway of the house. “H’sh!” he said, holding up his finger. The girl’s cheeks flushed and her eyes sparkled. “What are you doing in our yard?” she demanded. The captain’s face relaxed as the sound of voices died away. He gave his moustache a twist, and eyed her with frank admiration. “Fat policeman,” said the skipper, jauntily, twisting his moustache. Miss Pilbeam, only daughter of Sergeant Pilbeam, caught her breath sharply. “What have you been doing?” she inquired, as soon as she could control her voice. “Well?” said Miss Pilbeam, impatiently. “Lost his balance?” gasped the horrified Miss Pilbeam. She gazed at him with such a world of longing in her eyes that the skipper, despite a somewhat large share of self-esteem, was almost startled. “And he shan’t have me,” he said, returning her gaze with interest. Miss Pilbeam stood in silent thought. She was a strong, well-grown girl, but she realized fully that she was no match for the villain who stood before her, twisting his moustache and adjusting his neck-tie. And her father would not be off duty until nine. “I suppose you would like to wait here until it is dark?” she said at last. “I would sooner wait here than anywhere,” said the skipper, with respectful ardor. “Perhaps you would like to come in and sit down?” said the girl. Captain Bligh thanked her, and removing his cap followed her into a small parlor in the front of the house. “And I shall be pleased to see him,” said the innocent skipper. Miss Pilbeam kept her doubts to herself and sat in a brown study, wondering how the capture was to be effected. She had a strong presentiment that the appearance of her father at the front door would be the signal for her visitor’s departure at the back. For a time there was an awkward silence. “Lucky thing for me I upset that policeman,” said the skipper, at last. Miss Pilbeam—as soon as she could get her breath—said, “Ah, where indeed!” and for the first time in her life began to feel the need of a chaperon. “Funny to think of him hunting for me high and low while I am sitting here,” said the skipper. Miss Pilbeam agreed with him, and began to laugh—to laugh so heartily that he was fain at last to draw his chair close to hers and pat her somewhat anxiously on the back. The treatment sobered her at once, and she drew apart and eyed him coldly. He was so genuinely relieved when she said, “No,” that Miss Pilbeam, despite her father’s wrongs, began to soften a little. The upsetter of policemen was certainly good-looking; and his manner towards her so nicely balanced between boldness and timidity that a slight feeling of sadness at his lack of moral character began to assail her. The skipper shrugged his shoulders. “I don’t suppose I shall be,” he replied. “Aren’t you sorry?” persisted Miss Pilbeam, in a vibrant voice. Miss Pilbeam looked at the clock and pondered. It wanted but five minutes to nine. Five minutes in which to make up a mind that was in a state of strong unrest. Captain Bligh waited in respectful silence, heedless of the fateful seconds ticking from the mantelpiece. At the sound of a slow, measured footfall on the cobblestone path outside Miss Pilbeam caught his arm and drew him towards the door. She stood trying in vain to make up her mind. “Upstairs,” she said. “Quick!” and, leading the way, entered her father’s bedroom, and, after a moment’s thought, opened the door of a cupboard in the corner. “Get in there,” she whispered. “But—” objected the astonished Bligh. The front door was heard to open. “Police!” said Miss Pilbeam, in a thrilling whisper. The skipper stepped into the cupboard without further parley, and the girl, turning the key, slipped it into her pocket and sped downstairs. Sergeant Pilbeam was in the easy-chair, with his belt unfastened, when she entered the parlor, and, with a hungry reference to supper, sat watching her as she lit the lamp and drew down the blind. With a lifelong knowledge of the requirements of the Force, she drew a jug of beer and placed it by his side while she set the table. Miss Pilbeam raised her eyebrows. He stood up and exhibited the damage. He drew his chair to the table and helped himself, and, filling his mouth with cold meat and pickles, enlarged on his plans for the capture of his assailant; plans to which the undecided Miss Pilbeam turned a somewhat abstracted ear. By the time her father had finished his supper she was trying, but in vain, to devise means for the prisoner’s escape. The sergeant had opened the door of the room for the sake of fresh air, and it was impossible for anybody to come downstairs without being seen. The story of a sickly geranium in the back-yard left him unmoved. He went, despite his daughter’s utmost efforts to prevent him, and she sat in silent consternation, listening to his heavy tread overhead. She heard the bed creak in noisy protest as he climbed in, and ten minutes later the lusty snoring of a healthy man of full habit resounded through the house. She went to bed herself at last, and, after lying awake for nearly a couple of hours, closed her eyes in order to think better. She awoke with the sun pouring in at the window and the sounds of vigorous brushing in the yard beneath. Miss Pilbeam stole to the door of the next room and peeped stealthily in. Not a sound came from the cupboard, and a horrible idea that the prisoner might have been suffocated set her trembling with apprehension. An eager but stifled “H’st!” came from the cup-board, and Miss Pilbeam, her fears allayed, stepped softly into the room. “He’s downstairs brushing the mud off,” she said, in a low voice. “Who is?” said the skipper. “The fat policeman,” said the girl, in a hard voice, as she remembered her father’s wrongs. “What’s he doing it here for?” demanded the astonished skipper. “Lodger?” queried the skipper, more astonished than before. A horrified groan from the cupboard fell like music on her ears. Then the smile forsook her lips, and she stood quivering with indignation as the groan gave way to suppressed but unmistakable laughter. “H’sh!” she said sharply, and with head erect sailed out of the room and went downstairs to give Mr. Pilbeam his breakfast. To the skipper in the confined space and darkness of the cupboard the breakfast seemed unending. The sergeant evidently believed in sitting over his meals, and his deep, rumbling voice, punctuated by good-natured laughter, was plainly audible. To pass the time the skipper fell to counting, and, tired of that, recited some verses that he had acquired at school. After that, and with far more heartiness, he declaimed a few things that he had learned since; and still the clatter and rumble sounded from below. 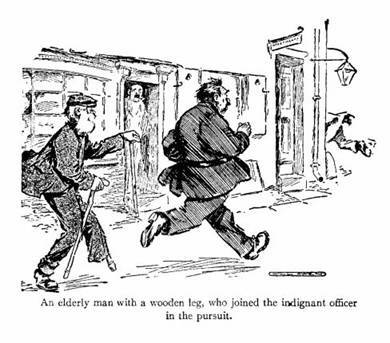 It was a relief to him when he heard the sergeant push his chair back and move heavily about the room. A minute later he heard him ascending the stairs, and then he held his breath with horror as the foot-steps entered the room and a heavy hand was laid on the cupboard door. 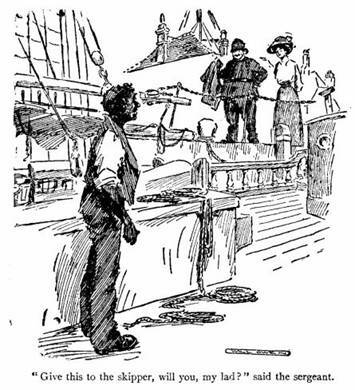 “They’re down here,” cried the voice of Miss Pilbeam, and the skipper, hardly able to believe in his good fortune, heard the sergeant go downstairs again. At the expiration of another week—by his own reckoning—he heard the light, hurried footsteps of Miss Pilbeam come up the stairs and pause at the door. A key turned in the lock, the door was flung open, and the skipper, dazed and blinking with the sudden light, stumbled into the room. “Father’s gone,” said Miss Pilbeam. The skipper made no answer. 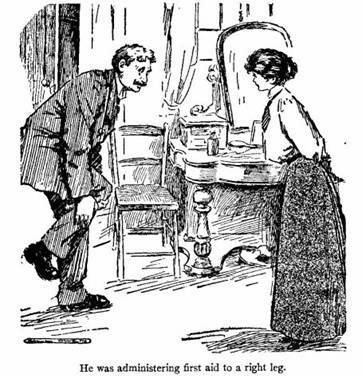 He was administering first aid to a right leg which had temporarily forgotten how to perform its duties, varied with slaps and pinches at a left which had gone to sleep. At intervals he turned a red-rimmed and reproachful eye on Miss Pilbeam. The skipper hobbled to the wash-stand, and, dipping his head in a basin of cool water, began to feel himself again. By the time he had done his hair in the sergeant’s glass and twisted his moustache into shape he felt better still, and he went downstairs almost blithely. “That’s why you laughed, I suppose?” said the girl, tossing her head. Captain Bligh put down his knife and fork and eyed her uneasily. The skipper started and smote the table with his fist. She shuddered; so did the skipper. “I might get off with a fine; I didn’t hurt him,” he remarked. Miss Pilbeam shook her head. “They’re very strict in Woodhatch,” she said. Captain Bligh gave a gloomy assent. “It’s your only chance,” said Miss Pilbeam. Captain Bligh leaned back frowning, and from sheer force of habit passed the ends of his moustache slowly through his fingers. “I think the coal-dust would be enough,” he said at last. The girl shook her head. “Father particularly noticed your moustache,” she said. “No,” said the other, stoutly. Miss Pilbeam put her handkerchief to her eyes and, with a suspicious little sniff, hurried from the room. Captain Bligh, much affected, waited for a few seconds and then went in pursuit of her. Fifteen minutes later, shorn of his moustache, he stood in the coal-hole, sulkily smearing himself with coal. 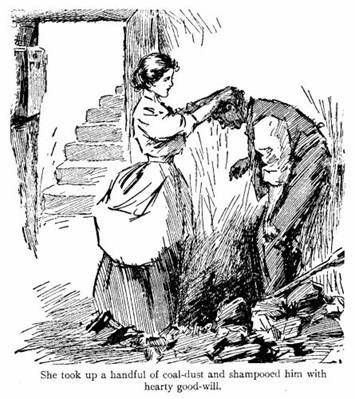 She took up a handful of coal-dust and, ordering him to stoop, shampooed him with hearty good-will. The skipper went, and came back in a state of wild-eyed misery. Even Miss Pilbeam’s statement that his own mother would not know him failed to lift the cloud from his brow. He stood disconsolate as the girl opened the front door. Captain Bligh promised, and walked slowly up the road. So far from people attempting to arrest him, they vied with each other in giving him elbow-room. He reached the harbor unmolested, and, lurking at a convenient corner, made a careful survey. A couple of craft were working out their coal, a small steamer was just casting loose, and a fishing-boat gliding slowly over the still water to its berth. His own schooner, which lay near the colliers, had apparently knocked off work pending his arrival. For Sergeant Pilbeam he looked in vain. He waited a minute or two, and then, with a furtive glance right and left, strolled in a careless fashion until he was abreast of one of the colliers. Nobody took any notice of him, and, with his hands in his pockets, he gazed meditatively into the water and edged along towards his own craft. His foot trembled as he placed it on the plank that formed the gangway, but, resisting the temptation to look behind, he gained the deck and walked forward. “Halloa! What do you want?” inquired a sea-man, coming out of the galley. “Shut up!” said the skipper, fiercely; and, walking to the forecastle, placed his hand on the scuttle and descended with studied slowness. As he reached the floor the perturbed face of Bill blocked the opening. “Had an accident, cap’n?” he inquired, respectfully. “I’m all right where I am,” said Bill, backing hastily as the skipper, putting a foot on the ladder, thrust a black and furious face close to his. The seaman, marvelling greatly, withdrew, and the skipper, throwing himself on a locker, wiped a bit of grit out of his eye and sat down to wait for the mate. He was so long in coming that he waxed impatient, and ascending a step of the ladder again peeped on to the deck. The first object that met his gaze was the figure of the mate leaning against the side of the ship with a wary eye on the scuttle. “Come here,” said the skipper. “Anything wrong?” inquired the mate, retreating a couple of paces in disorder. The mate advanced slowly, and in response to an imperative command from the skipper slowly descended and stood regarding him nervously. He caught the mate by the coat as he was making for the ladder, and hauled him back again. “What’s it got to do with you if I stay out all night?” pursued the skipper. “Nothing,” said the other, feebly. “What did you go to the police about me for, then?” demanded the skipper. “Do you mean to say you didn’t report my absence last night to the police?” said the skipper, sternly. “And the police haven’t been watching the ship and inquiring for me?” asked the skipper. The mate shook his bewildered head. “Why should they?” he inquired. The skipper made no reply. He sat goggle-eyed, staring straight before him, trying in vain to realize the hardness of the heart that had been responsible for such a scurvy trick. “Besides, it ain’t the fust time you’ve been out all night,” remarked the mate, aggressively. The skipper favored him with a glance the dignity of which was somewhat impaired by his complexion, and in a slow and stately fashion ascended to the deck. Then he caught his breath sharply and paled beneath the coaldust as he saw Sergeant Pilbeam standing on the quay, opposite the ship. By his side stood Miss Pilbeam, and both, with a far-away look in their eyes, were smiling vaguely but contentedly at the horizon. The sergeant appeared to be the first to see the skipper. Captain Bligh, who was creeping slowly aft, halted, and, clenching his fists, regarded him ferociously. “Was,” said his daughter, in a mournful voice. He kissed the top of a fat middle finger, and, turning away, walked off with Miss Pilbeam. The skipper stood watching them with his head swimming until, arrived at the corner, they stopped and the sergeant came slowly back. He jerked his thumb in the direction of Miss Pilbeam and winked with slow deliberation. “She’ll be there, too,” he added. “Savvy?